We’ve just returned from a few days away in Bath, Somerset. We stayed in the Macdonald Bath Spa Hotel, which is the finest hotel I’ve ever stayed in. I don’t say that lightly. We’ve travelled around the UK over the years and stayed in plenty of hotels, and plenty of spa hotels, but this was the best. The rooms are fab and spacious, the freebies are fab, the breakfast is fab, the spa (with indoor and outdoor swimming pools, the outdoor having natural Bath spring water, the spa also having a steam room, ice room for the overheated, salt room for weirdness, Jacuzzi, and two saunas) was fab, parking was fab, and well everything was perfect. All the staff are so nice. We were treated like royalty from the moment we walked in, to the moment a hotel porter gave me a lift to my car in a golf buggy with our bags yesterday. Cinabar was a bit jealous at that so after another few hours relaxing in the spa, and a steak sandwich each, the same hotel porter insisted on giving us both a lift back to my car. It was really difficult to leave on Friday afternoon, so much so that we left it a little too late and got stuck in traffic trying to get out of Bath. I’d recommend if visiting and if you can tear yourself away, to leave by 3.30pm! On the first evening after a four-hour relax in the spa chilling out from the long drive, we had a meal in one of the two restaurants. 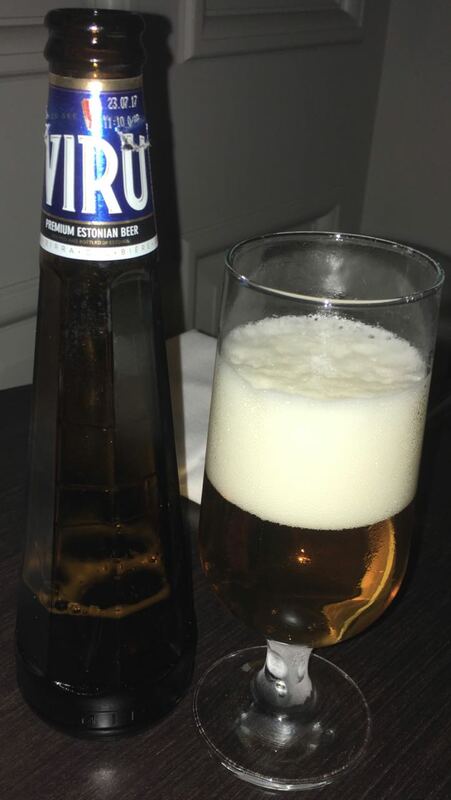 I had a sumptuous bacon and blue cheese burger with chunky chips washed down with this Premium Estonian beer. I was fascinated by its funky shaped bottle (see photograph). I guess I’m used to the usual brown and fairly boring ones from every store shelf. Anyway, its ingredients were the usual water, malted barley, and hops. It was heavy on the malted barley in the aroma with a kind of sweetness, probably from caramel malt with pale malt mixed in, and there was also a decent yeasty smell on pouring. At 5% volume, Viru had an initial subtle malted barley flavour where the sweetness intermingled with the pale malt; citrusy bitterness then follows through from the hops and into the aftertaste. This well travelled beer gave my tastebuds a journey through flavours of sweet malted barley, pale malts and hoppy bitterness that went perfectly with my burger and chunky chips. It was certainly a fantastic start to a fantastic stay in one of our finest cities, with Roman Baths, quirky shops and eateries, and Georgian architecture. Just watch out for the traffic!